No, I am not back to my bad old habits. After another writing date with Susan, I produced five more pages of my novel and am still on target to finish the first draft sometime this fall. However, I had already signed on to help with a big NYCLUG community build last week that had to be completed by the beginning of September. What, you may ask (as one of my followers did on Instagram), is a community build? It’s when members of a LEGO User Group gather in a public place to complete a major project. 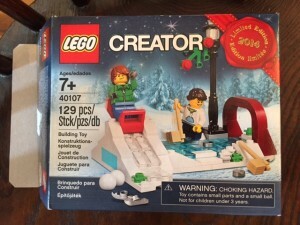 While this build was assigned in the summer, it involved a winter motif, as LEGO sent us 50 boxes of the Creator set 40107, an ice skating rink given away last winter to accompany the Winter Village sets. Shoppers at the LEGO Store and online received this set for a purchase over $75, but apparently the company made too many of them. So, months later, they challenged the various user groups to build a scene set in their local area from the pieces of 50 boxes. We could not add pieces, and we had to use as many of the ones we were given as possible. Under the leadership of Sid Dinsay, our group met outside the Flatiron LEGO Store last Thursday and 5:30 p.m., and we claimed our seats alongside Madison Park and started to build around 6. Actually, we started to sort around 6. Building didn’t start until 7:30, after nearly all the packages had been opened and the pieces sorted by size and color into a dozen plastic cups that crowded the two round tables that we commandeered. There were five of us — Sid, Howard, Moa, James, and me. Since most of the pieces came in the colors of snow and ice, I suggested a scene out of the movie The Day After Tomorrow, much of which takes place in the ice-encrusted main New York Public Library building on Fifth Ave. at 42nd St. I brought still photos from the movie. Others had photos of the library. Architect Moa worked with Sid to assemble the library’s base while the rest of us continued to sort. With James and Sid. By the time the staff kicked us out of the park, we had finished the library except for the roof. As we worked, various passers-by stopped to talk to us. If the community build was designed to spark interest in LEGO and its possibilities, it was our time and the company’s money well spent. We did not, however, recruit anyone to join us. I wonder if the build was too intimidating. Sid is an experienced LEGO builder, and other members of our group have backgrounds in architecture and engineering. Even though I have less professional training than the others, I took a number of classes in architecture and urban planning in college and graduate school, enough to have a minor in urban planning. My dissertation, had I pursued it rather than chasing my dream of becoming a novelist, would have explored the history of urban planning in the United States. 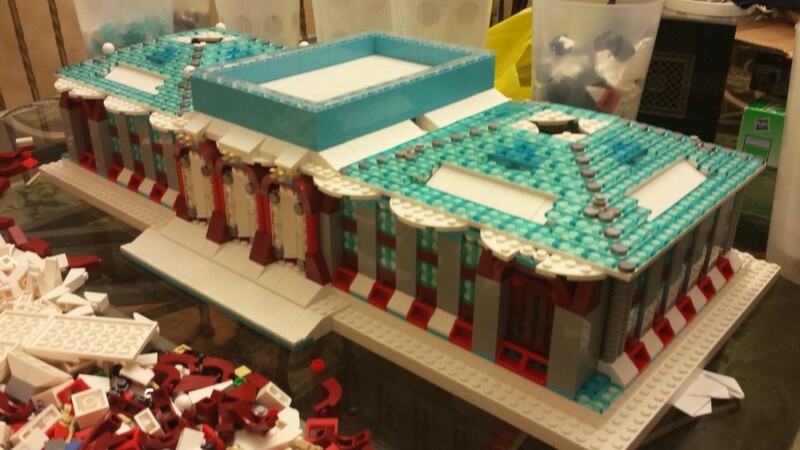 The base and columns of the 42nd St. Library were easy. Sid’s design for the windows was brilliant, using hinge plates and evoking the panes on the micro scale using grate pieces. The biggest challenge was the roof. James, Moa, and I tried various designs, but Sid’s was the one that worked best. We had spent so much time sorting, though, that by 9 p.m. when the park crew came to take away the tables and kick us out, we had only the ice skating rink, which doubled as a section of the roof, and two different designs for the other two sections. We split up pieces to take home, to continue the build another day. I took the minifigures home along with one of the roof designs. (While others worked on the building, I assembled the scene’s “characters.”) Sid took the rest, and that night, he made a second roof section like his first, using the remaining the curved white plates and transparent tiles. Our library, after Sid finished the roof. 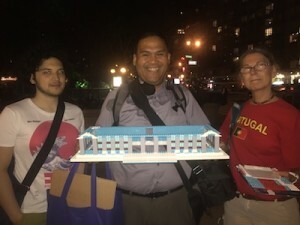 Last night, Sid posted the more-or-less finished building on Instagram and tagged the New York Public Library. I hope the library has some exhibit space somewhere for this build, because it is a beautiful replica that reflects the classic beauty of the building and honors its place in our community. I’ll keep you posted on where this NYCLUG build eventually lands. And thank you to the New York Public Library for hosting my reading of Surviving Santiago on August 5, as part of the Teen Author Night at the Jefferson Market Library. If I had Sid’s building chops, I’d create a model of that library as well — but I think my time would be better spent finishing my next book! 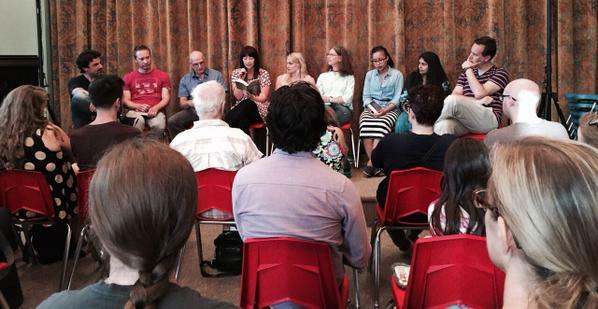 Teen Author Reading Night, from left Paul Griffin (Adrift), Jon Skovron (Man Made Boy #2), Gordon Korman (The Dragonfly Effect), Kate Ormand (The Wanderers), Katelyn Detweiler (Immaculate), me (Surviving Santiago), Dhionelle Clayton and Sona Charaipotra (Tiny Pretty Things), and moderator David Levithan.